Today we are taking a look at azelaic acid hair loss treatments, an alternative option for many. Azelaic acid is an organic compound found in barley, wheat, and rye. In plants, this compound acts as a defense mechanism in response to infections. Although it is an acid, it is very mild and is not harmful to the skin. Its primary medical application is for the treatment of both comedonal and inflammatory acne. Furthermore, secondary applications include treating the skin condition Rosacea, skin pigmentation disorders, and in some cases, is used as a natural alternative for skin lightening treatment. Azelaic acid is FDA approved for treating acne. Consequently, it is also great at treating dandruff. Azelaic acid for hair loss is not an FDA approved treatment. Obviously, most importantly for our purposes, is the use of azelaic acid for treating androgenic alopecia (also known as baldness). In the sections below we give our two cents on its effectiveness, links to official studies, best ways to go about treating hair loss with azelaic acid, and then share the most popular hair loss products that include azelaic acid in their formulas. Here is our comparison table of the best azelaic acid products for hair loss. In our review section further down the page, we take a closer look at five popular options. Many people are very interested in how azelaic acid actually treats hair loss. There are many theories as to how exactly azelaic acid for hair loss works. Research that was documented by the British Journal of Dermatology indicates that azelaic acid may be a potent inhibitor of 5-alpha reductase. 5-alpha reductase inhibitors are best known for being able to prevent the conversion of testosterone into the more potent dihydrotestosterone. DHT is the leading cause of hair loss in androgenic alopecia (male pattern baldness). The study also found that when azelaic acid is combined with Vitamin B6 and Zinc—which are both minimally effective alone—the combination of ingredients inhibited 5-alpha reductase by 90%. What is also noteworthy, is that zinc has been shown as an effective in treating other disorders relating to dihydrotestosterone. These include disorders such as prostatic disease. This indicates that zinc may play some role in preventing some of the causation factors of androgenetic alopecia as well. Coincidentally, based on these scattered findings some manufacturers of hair loss treatment products have included azelaic acid in their lineup of ingredients. While this all sounds well and good, the evidence for azelaic acid is far from definitive. There are still thorough limitations with the studies that have been done on azelaic acid. Questions about how effective it is at treating hair loss are still circling. For example, the study completed by the British Journal of Dermatology was conducted in vitro. It’s another way of saying it was not done on an actual living organism. So there is still a bridge that needs to be built. We hope in the future more studies will be conducted on its efficacy. Ultimately, more hard data would help prove the theory by showing it working in practice on a large sample size of actual human beings. Until more research is completed, we would not suggest using an azelaic acid for hair loss as a standalone treatment. As mentioned, azelaic acid has not been extensively studied as a treatment for hair loss. This will likely change in the near future as the search for viable hair loss treatments intensifies. The first study on azelaic acid was done over 25 years ago. This study investigated whether zinc or azelaic acid is better at treating and blocking DHT. The second study was conducted in 2005 and it compared the efficacy of azelaic acid to anthralin. Also is it important to note that this ingredient is more effective for men than women, as DHT is the leading antagonist of hair loss in men. Stamatiadus, British Journal of Dermatology. 1988. Find at Wiley Online Library. Sasmaz, American Journal of Clinical Dermatology. 2005. Find at US National Library of Medicine. Nevertheless, just because the trials have not been conducted does not mean it is an ineffective ingredient in treating hair loss. It only means it is just not a proven treatment for hair loss. We like to stick to the tried and true proven treatments before we give our stamp of approval and strong recommendation for any hair loss solution. Though on the surface azelaic acid does seem to have some interesting studies. Furthermore, we have heard from a lot of people who have switched from pure minoxidil solutions to minoxidil/azelaic acid solutions claiming to have much better results with the latter. This makes it difficult to completely write it off or even tell people it’s a waste of money. The bottom line is if you have the money for a “premium” topical solution that includes azelaic acid, it certainly couldn’t do any harm. You may want to try it out for 6 months and see if it makes a difference. Do this rather than just buying plain minoxidil (which would be the less expensive strategy). Generally, rigorous testing and trials happen because companies and organizations have a profit motive. Azelaic acid is widely available and relatively inexpensive, which may explain why additional studies have not been undertaken. If lack of evidence doesn’t dissuade you from wanting to give it a go, we’ve included a list of the most popular hair loss products that contain azelaic acid below. The nice thing about using azelaic acid is that you won’t need to change your routine much if you’re already using minoxidil. It is applied topically just like minoxidil. A variety of companies has released products that contain both 5% minoxidil as well as azelaic acid (which means only one application). Here we take a closer look at hair loss prevention products that include azelaic acid. These products are an excellent complement to a Propecia and ketoconazole regime. These products also contain a slew of other ingredients in a sort of shotgun scattershot approach. The theory on why they are so effective? The formula supplies a one-two punch to hair loss. 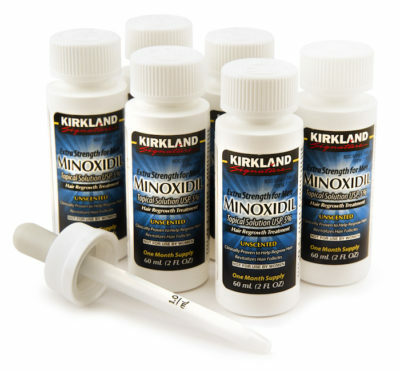 Minoxidil acts as a new hair growth stimulant. Azelaic acid acts as the DHT-inhibitor that addresses the root of the problem, so to speak. The products reflect the same order as the table above- priced low to high. Combine the power of elastin, Vitamin B, grapefruit, and peppermint oil! All of these natural ingredients combine with azelaic acid to pack a punch. As we’ve mentioned in other articles on Hold the Hairline, having healthy hair starts at the scalp. Conditioning the scalp makes for healthier growth. Dr. Dennis Gross also uses copper peptide and Vitamin C to help hydrate and renew hair. Consumers have recommend using it with Regenepure and other powerful hair loss shampoos. We suggest rotating this into your hair cleaning routine by using it only once or twice a week. It’s powerful stuff, and you should only need a little bit to work through your roots and into the scalp skin. This is an interesting, relatively new product from MiN New York. As you probably guessed, MiN New York is a US company based in New York. They sell a growing and wide range of luxury grooming, cologne, and hair and skin care products for men. The Manage Grooming Cream is essentially one part deep conditioner, one part hair styling product, and another part hair loss prevention. With Biotin, Zinc Sulfate, Copper Peptide Y3, Saw Palmetto, and Azelaic Acid it has a stellar lineup of ingredients. The product instructions state it can be applied to dry or towel dried wet hair. Most likely, those of us with longer and thicker hair will prefer the latter course of action. Final Note: Caffeine has had some interesting results in the hair loss prevention field. Some hair loss shampoos have begun to use caffeine as one of their go-to ingredients. One of the best selling hair loss products of all time, UltraLabs Hair Surge Caffeine Hair Growth Stimulating Shampoo includes a caffeine blend in its ingredients. It is also highly rated on Amazon with 4.5 stars. For more information you can read our review here. This is the version of Lipogaine’s topical treatment is made specifically for women with thinning hair. Apply this topical solution twice a day. Use no more than 1 ml at a time. The product formulated by the distinguished doctor Dr. Nasser Razack. Apply this spray to the scalp twice a day. Fairly similar to Revivogen (though it smells worse), it contains many of the same ingredients. Unlike Lipogaine and Perfect Hair, it does not include minoxidil. We would suggest still using a minoxidil product as part of your hair loss treatment system. Similarly, other notable ingredients include Linolenic acid, Zinc, Niacin, Vitamin B6, Ginkgo biloba, Oleic acid, tea tree oil, Riboflavin, Vitamin E, grape seed extract, and Saw palmetto. Dr. Razack also wrote a comprehensive book on conquering hair loss that is available in paperback. It is worth the read if you are serious about keeping your hair. Lipogaine manufacturers an intensive topical treatment for hair loss sufferers. It contains a host of ingredients including their proprietary herbal DHT-blocker. The DHT-blocker Azetinol is included in the formula which contains the azelaic acid. Retinol, saw palmetto extract, beta-sitosterol, apple polyphenol and B vitamins are also thrown in the mix for good measure. One of the great things about Lipogaine’s formula is that it includes 5% minoxidil. This makes it a one-stop-shop topical treatment. You won’t need to purchase and use an additional minoxidil product in your regime. Consequently, like Crinagen above, Revivogen does not have minoxidil. If you are looking to go all out and wage full-scale war on your pattern baldness, you could use this in addition to minoxidil. Apply this serum only once a day, instead of two. It is also great for those but if you are looking for a more natural solution for hair loss with no side effects this might be the right one. Particularly if you are set against using a chemical such as minoxidil it is a great herbal option. Revivogen has some science backing it up and while it may not be as effective as minoxidil, it is a solution. It does have azelaic acid in its ingredients. It is the only solution we have found that has nearly all the proven natural ingredients shown to inhibit 5-alpha reductase. The key ingredients in this formula are GLA, ALA. Linoleic Acid and Oleic Acid are essential fatty acids found in plants. Each have been individually proven to inhibit type I and type II 5-alpha reductase (propecia is known for inhibiting type I). These key ingredients are further complemented by the Azelaic Acid, Zinc, and Vitamin B6 which have scientific evidence showing them also to be effective inhibitors of 5-alpha reductase. Top this off with procycyan and saw palmetto and you have one of the most powerful natural formulas on the market. Hair Growth Laboratories’ hair loss treatment is very similar to Lipogaine’s Complete Hair Loss Solution. It also contains 5% minoxidil and uses the “shotgun scatter shot” approach. By mixing in dozens of other ingredients, they supplement the hair growth stimulant of minoxidil with DHT blocking agents. Like Lipogaine’s product, you’re going to find it’s at a higher price point than a run of the mill minoxidil product such as Rogaine. But you’re paying extra for a handful of other ingredients and a more powerful formula. First of all, we love NutraViv’s Hair Growth Serum. This serum containts Azelaic Acid, Green Tea, B Vitamins and so much more. NutraViv regrows hair that has been lost within the first two months of daily use. Most noteworthy, it blocks DHT without using minoxidil. The essential oils are also great for stimulating growth. Because of the ingredients, we can say that this product is great for both male hair loss and female pattern hair loss. NutraViv uses gluten free ingredients and also doesn’t test on animals. This particular product fights hair loss in men. It is a maximum strength formula, so we recommend doing spot tests before diving into regular use. Procerin fights the effects of androgenetic alopecia. Users report seeing regular growth in addition to positive results. The foam, aside from azelaic acid, also contains saw palmetto, rooibos, grape seed extract, primrose oil, and so many more ingredients!